- OK. Get a box of tissues. I was cleaning out my recipe box (I know, right?!!) when I came across my neglected and battered and splattered "Recipe X" recipe. Memories came flooding back: laughter, tears, hand clapping. My sister-in-law, Nancy, loved Recipe X, in fact, I think she named it. And whenever I think of Nancy, she's got her head thrown back, laughing and smashing her hands together in a huge clap. 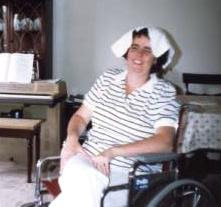 Nancy had MS. She was already in a wheelchair when I entered the family. She enjoyed a perfectly healthy, lively life until around 18 or 19 when her legs started their own rebellion. By 21, 22? she was permanently in a wheelchair requiring, many times, her own brothers to assist her in public restrooms, among other things. Unspeakable humility and love. In the early years of my life as a Sliker, we took Nancy to hear her favorite band. 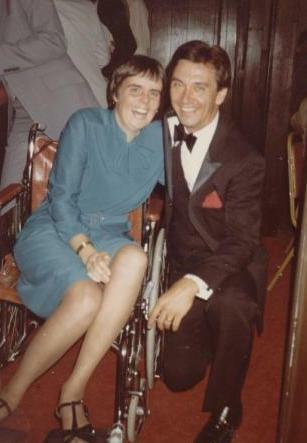 I watched my new husband grab his sister's wheelchair, roll her onto the dance floor and dance, chair spinning, whirling and wheelie-ing to the tune of her laughter. Nancy laughed. A lot. I smoothed the tattered recipe card on the counter, pressing out the wrinkles, smiling, crying. Nancy was a party waiting to happen. Always "in" for a good time. Always giving you a "thumbs up" from across the room. My husband was pushing his sister down a grassy hill, trying to cross a muddy creek. Nancy was screaming at him, torn between laughter and fear. We were taking a short cut in our walk to the pizza joint (you know it!). "Tommy just take me back, I think we need to go back!" Tom kept tugging and pushing, "You said you wanted pizza, you're gonna get pizza." He sludged (is that a word?) the chair across the creek and pushed it up the opposite bank, mud squirting off the wheels. As we ate pizza across a table in a noisy pizzeria, I never dreamed this wouldn't last forever. That's me. Always thinking life as-it-is will last forever. I'm learning though, I'm learning fast that nothing lasts forever and life is short, people are precious. 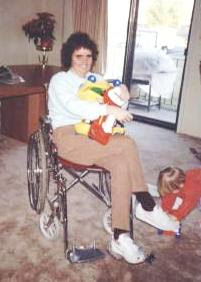 Tommy used to stack all his toys on "Nat Nat's" lap. I can't remember why. That's how she played, I guess. There's a new book out "Crazy Love" that everyone seems to be reading. When I think of Crazy Love, I think of the love Tom had for his sister. It was just crazy. The things he did were crazy. I remember once he rented a Hoyer lift and got her in our swimming pool. I can still see her in that lift, dangling over the water, swaying. We laughed so hard. Once in the water, she didn't like it and got out quickly. I imagine it was terrifying to be in the water knowing that if you go under you can't get yourself out. Nancy ended up in bed for her last few years, rarely getting up and out, still smiling, still partying and still giving the thumbs up. She had a strong faith in Jesus Christ and I know she's in Heaven now, she died in August of 2002, way, way, way too young. Here's her brother Bobby with some nieces and nephews at one of her last birthday parties, maybe the last one. 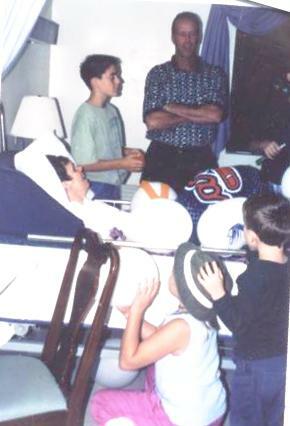 We had no earthly idea Bobby would die just over a year later. And then Marilyn would die in May of 2009. Tom's 46 years old and has lost three siblings. His parents have buried three children. "Life should not be a journey to the grave with the intention of arriving safely in a pretty and well preserved body, but rather to skid in broadside, thoroughly used up, totally worn out and loudly proclaiming 'What a ride!!'" I'd love to hear your Nancy stories, drop me a comment. Precious Val...memories are more valuable than gold. I wish you and your family a wonderful holiday season together. OK-- here's a Nancy story. We were living in Atlanta and newly married, and we were having one of our first parties with some friends from church. We were both new at entertaining. For some reason, you served the baked beans ice cold. Not sure if that's the way you liked it or that's the way your mom did it, or you read it in a book. I didn't eat beans so I had no comment. Our guests were all politely eating the beans, but then Nanc took a mouthful and blurted out, "These beans are cold!" I remember your shock and surprise and I remember one other guest saying to Nanc, "Yeah, I noticed that, too..."
Thanks for this post-- it brought back some sweet memories. Nancy was one of the sweetest girls I've ever had the privilege of knowing, she always had that beautiful smile on her face, we loved her like one of our own. 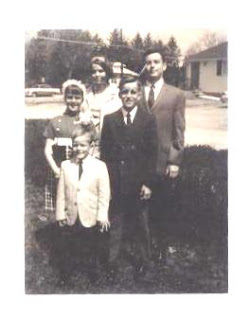 Tom was an incredible brother I can still see him taking her into the bathroom and me with my mouth wide open in unbelief that a brother would do that, he loved his sister with a love that one doesn't see much in siblings. We're looking forward to seeing Nancy again soon! I'll never forget the time I was spending the night at Aunt Pat's house as a kid, and Nancy and I decided to surprise her by cleaning the kitchen floor. We used Pledge. Yep yep, you can guess what happened. It took a lot of scrubbing to get the slick finish off that floor! Nancy and I laughed about it for years.